Everyone loves a good scrub down. Getting in the shower, lathering yourself up with body wash, scrubbing yourself down, stepping out and brushing your teeth, apply globs of facial products, and voila, you’re a clean person! But if you are using products with microbeads, you may be contributing to the pollution of our waterways. Microbeads are tiny bits of plastic that go into a large number of cosmetic products and are often invisible to the naked eye. These little bits of plastic may help exfoliate your dead skin, but they are then washed down the drain. The big problem with these tiny beads is that they are too small to be filtered out in water treatment facilities, so they pass right through and go into our lakes and oceans. Well, I know what you’re thinking, “Tiny bits of plastic in our water??? That’s the least of our concerns with water pollution”. Okay, point taken. There can be a lot of trash in our bodies of water, but microbeads are unique. 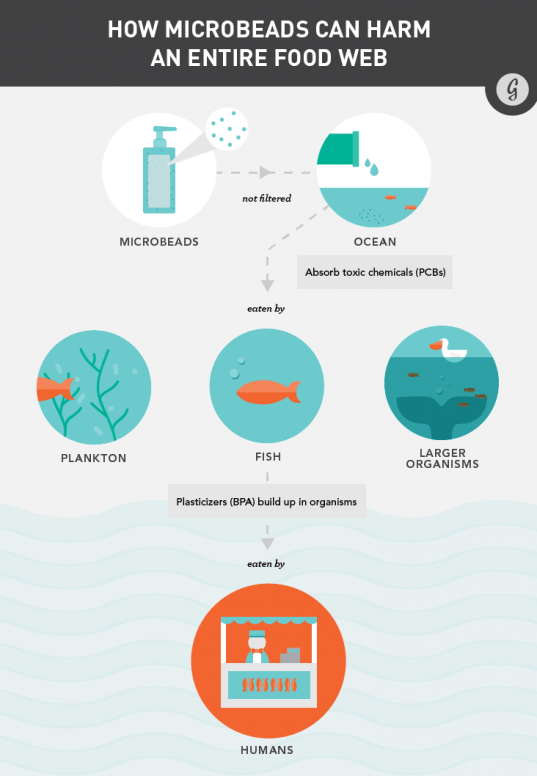 Microbeads look like food for some marine organisms, so they eat it (yum!). The beads then accumulate in our wildlife and if we choose to eat some fish from these areas, the microbeads can enter the human system. Is that really worth a good shower scrub? After ample research has shown that these microbeads can accumulate to levels as high as 1.1 million plastic particles per square kilometer, as in Lake Ontario, legislations are starting to put a ban on these products in the Great Lakes states (Check out this NPR article for more details). Although legislation can lead the way to ban microbeads, you can do your part and stop using products with microbeads! It may be awhile before these products are fully banned, so you need to act now to avoid the products. How to check your product for microbeads. When I first learned about the problems with microbeads, I asked the cosmetologist at the drugstore if she could recommend a product without microbeads for me. She looked at me with an epically blank stare and I realized she had no idea what they were. (Cosmetology schools… you need to get on that!). So I realized that I needed to take it into my own hands to figure it out. 1. Look for products that contain polyethylene or polypropylene in the ingredients. 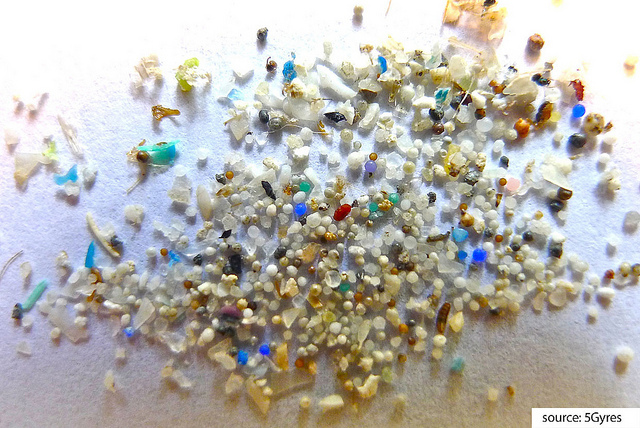 That indicates that there are most likely small plastic microbeads in the products. Products that advertise as exfoliants or scrubs should be looked at with extra caution. 2. Download the app. Beat the Microbead is an international campaign against microbeads in cosmetics who created an app where you can scan or look up items to check if they are microbead-free. 3. Buy from companies that have banned microbeads from their products already. Check out Lush for brand that has committed to phasing out microbeads in their products. However, always read the labels because they may still sell the older products that contain plastic! 4. Make your own products! I definitely need to do more DIY and I think this is the push I need. When you make your own products, you obviously know what goes into them. You can make a sugar face scrub by easily combining 1/2 cup of sugar and 1/4 cup of olive oil. Easy as that. You can also reuse your coffee grounds into a whole body scrub. No one is perfect. It may be hard to phase out these products at all at once. Start by picking products that you think, “Meh, I never really loved that anyways…” Soon it will be easy to choose all micro-bead free products. Let me know what products you choose to switch out. Find a favourite micro bead alternative…let me know! ← Previous Post What did you miss? Geological features that go unnoticed.